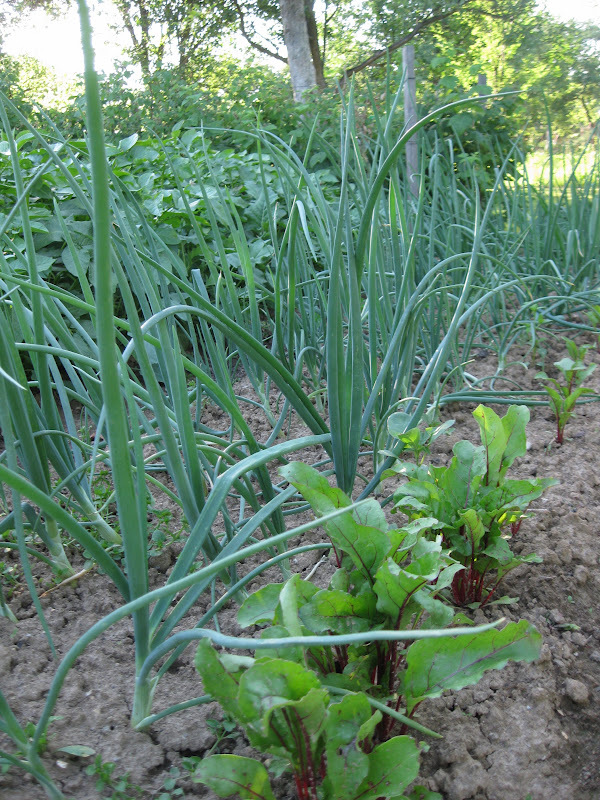 Go to any of Slovakia's numerous smaller towns and villages and you'll notice rows of pre-war houses sitting toward the front of narrow, long plots of land, the backs of which are often dedicated to vegetable gardens (and occasionally guarded by packs of chickens). In Slovakia, when you get out of the city, you notice that A LOT of people have pretty impressive vegetable gardens in their backyards. 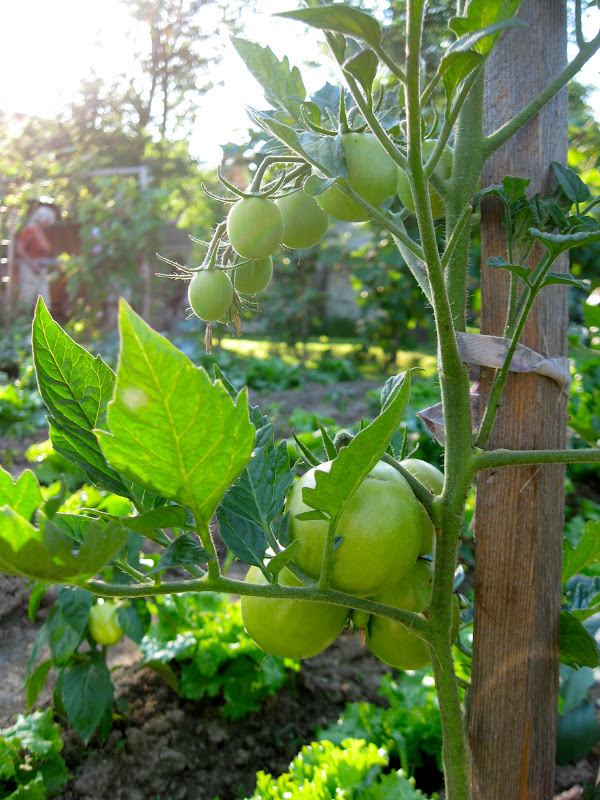 Plus, it's not uncommon for those who don't live in houses with backyards to own a patch of land that's walking distance from their place, on which they spend countless hours tending their vegetable patches. 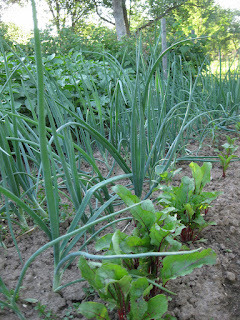 People in Slovakia have been gardening for eons, and while it is feared that younger generations are losing touch with this close connection to the land, you still see plenty of lush gardens overflowing with food. For many, particularly retirees who live on skimpy pensions, this is a productive use of time as well as a good and healthy alternative to buying food in the grocery store. 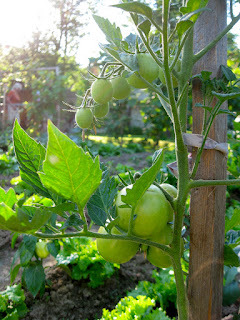 Potatoes and cabbage are among the most commonly grown veggies. Many people store the potatoes (a staple of the Slovak diet) in their root cellars, and make sauerkraut out of their cabbage, which they also store in large vats in their cellars. Supplies typically last through the winter! It's also common to pickle things, like beets and carrots, which again, are stored in jars in the root cellar for the winter. Terezia's parents work their butts off every spring and they can boast of a particularly bountiful garden overflowing with snow peas, carrots, tomatoes, bell peppers, beets, two types of potatoes, a variety of lettuce greens, cabbage, spinach, melons, spring onions, flat-leaf parsley, corn, strawberries, and several other things that are escaping my mind right now. They've also got some raspberry, blackberry, and grape vines, as well as a slew of apple and plum trees. At the behest of Terezia, they apparently grow a little more than the average Slovak, particularly in the lettuce green department. 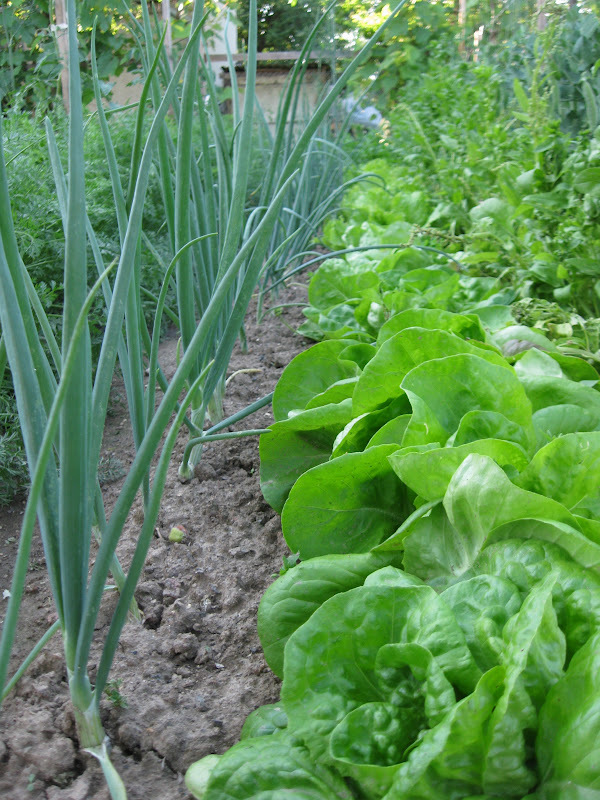 Sadly, it seems that most Slovaks grow lettuce greens solely as food for their chickens or other animals (Slovaks are not big salad eaters, but that means more lettuce greens for us, as we eat salads like there's no tomorrow). Several weeks ago, Terezia's mom went to a neighbor down the street to buy some lettuce greens, and the neighbor asked, "so are you buying this to feed your mother's chickens?" She had to explain to her, "no, my daughter is making us eat salads tonight." We went to Terezia's parents' place in Podrecany over the weekend to celebrate her dad's birthday, and the garden, which has really been taking off this past month, was screaming out for me to whip out the camera and snap some photos. The garden from the other end. Notice the sea of potatoes. The trees on either side are a mix of apple and plum. In the fall, Terezia's dad collects the fruit that falls from them and uses it to make his booze. Cabbage, which will undoubtedly contribute to this year's batch of sauerkraut. 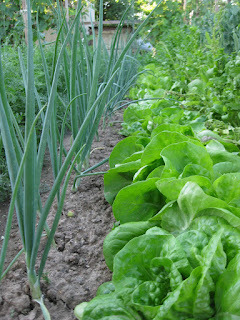 Lettuce greens and spring onions. Terezia's mom sharing some snow peas with her niece's daughter Ninka. These peas are addictive - I'm constantly wandering in there to nibble on them. Sunday morning, Terezia's brother Tony and I went up the hill to the town mansion and explored the premises a bit. This required hopping the fence, something I've been wanting to do ever since I first saw the place (it's privately owned, not open to the public). Luckily there were no angry guard dogs. I don't know a whole lot about the place, but no one currently lives there and there's something a bit mysterious about it. It's situated on a prime piece of real-estate and is surrounded by several acres of gardens, which have over the years become wildly overgrown. It's apparently being restored by the owner. I would love to get a look inside. As an added bonus, there happens to be a massive nest of a bocian (Slovak for stork) on one of the chimneys. 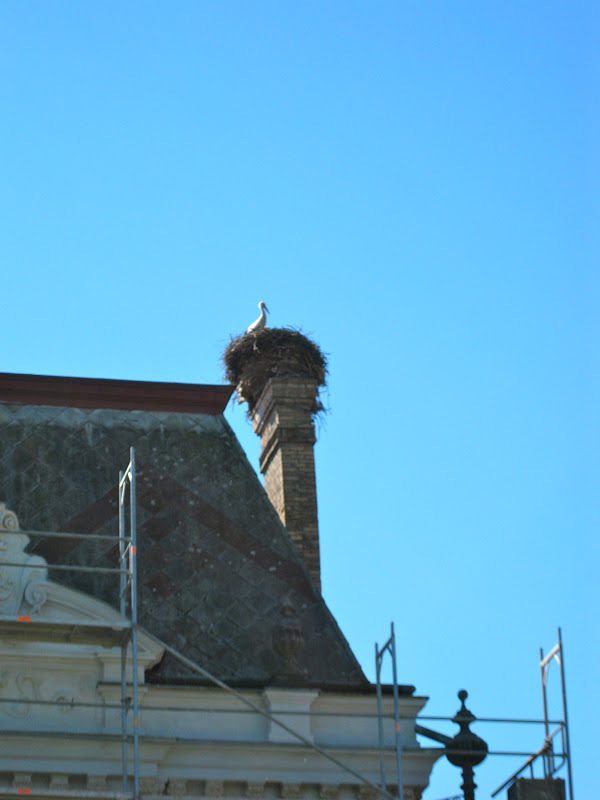 You can see storks and their nests all over this area of Slovakia. Seems like every village has one. 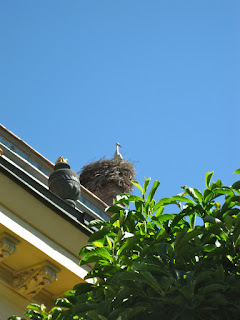 This time of year you can spot the mother stork sitting in the nest with the heads of her babies poking out. Very cute. I'm seriously fascinated by these birds and their enormous nests because there are simply none of this size in the Bay Area in areas where humans have settled. The front of the mansion: notice the bocian nest atop the chimney on the right, as well as the cheap Communist-era remake of the fountain, front and center. 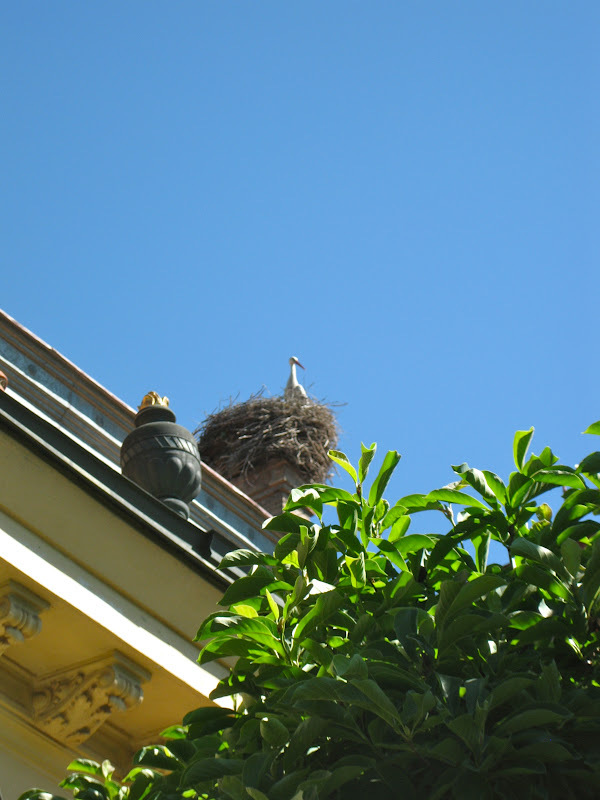 A bocian (stork) keeping watch over the house. "What's it doing? WHAT DOES IT WANT???" Jeff, My great grandma and grandpa were from Russia (I don't know exactly where) and my grandma always had a big garden. She made the best pickles that were spicy with big sprigs of dill. Long after she had died, I drove to the old ranch where they lived, which was by then abandoned. I went into the old garage and there, on a shelf, were jars and jars of those pickles. They must have been 20 years old, covered in a thick blanket of dust. It made me sad, but I had this funny happy feeling too, about my old Russian Great Grandma. That's an awesome story about your grandparents, Brandon. Very cool that their "legacy" lived apparently lived on in those pickle jars. I had no idea that you had Russian descendants! I bet they had some fascinating stories. Those East Europeans are cuckoo for pickling anything that is pickle-able. While at the in-laws a few weeks back, I got to try some actual dill pickles that they'd made from the cucumbers that they'd grown, and they were extremely tasty. They had several jars of 'em, and they would drink the juice.